Warmth that Make You Smile, Enjoy the Kotatsu! The wooden table frame covered by futon, just put your legs under those cover and you will be fascinated by the warmth of it! They are Japanese kotastu. If you have one of these, then you’re all set for the winter! I’m sure a lot of Japanese people are fan of this kotatsu. Have some green tea and tangerines and you’re ready to get comfortable watching TV in it. Oh, this is gonna make you so lazy (laugh). 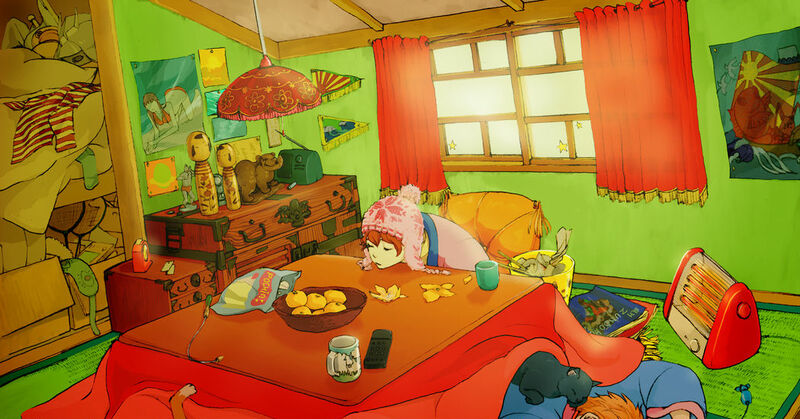 Today we feature illustrations of kotatsu. Take a look!